The ‘mews’ of old were houses that integrated living and working into a very compact and functional space. 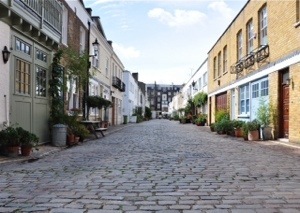 The mews houses were the stable servant quarters for the larger residential homes that they backed onto, they are dotted all over London and other cities in Europe. The pre-gentrified mews homes had stables for the horses on the ground floor and living quarters for the servants on the top floor. The large residential homes faced the main streets, the main address, and the mews homes faced the mews or laneway. The servants could take care of the horses, come and go as the please without impacting the families in the main homes. Of course we have come a long way in equality since then (irony intended) and we no longer travel by horse and carriage, we no longer have servants living at the bottom of the garden but the concept of density and affordability is one that shouldn’t be forgotten. Why shouldn’t our main address residential houses keep the street front that the price commands but affordable housing is provided as a mews at the rear of the property. The average density of the area would increase, we could incorporate breeze ways within our developments, we could integrate a greater diversity of age and family mix. And, if the mews house is on the title of the main house, it could provide a great level of flexibility for the growing family. The main house could be a 2bed, with a 1 bed mews house. When the couple are young they could rent out the mews house, as kids come along they could use the mews as a granny flat, as the kids get older a teenage retreat and as the kids move out they could rent out the mews again. But it requires a change in planning, a change in market perception and a change in design. But hey we were doing it in the 17th century. Radical resource productivity at its best. you’ve been walking around london again haven’t you! Interesting idea. Where I lived in Southern California (Redlands) we called these “back houses.” I’m not sure of the history of them; I don’t think that they date back to a time of servants. They did provide extra (affordable) housing and I think that they are a great solution!